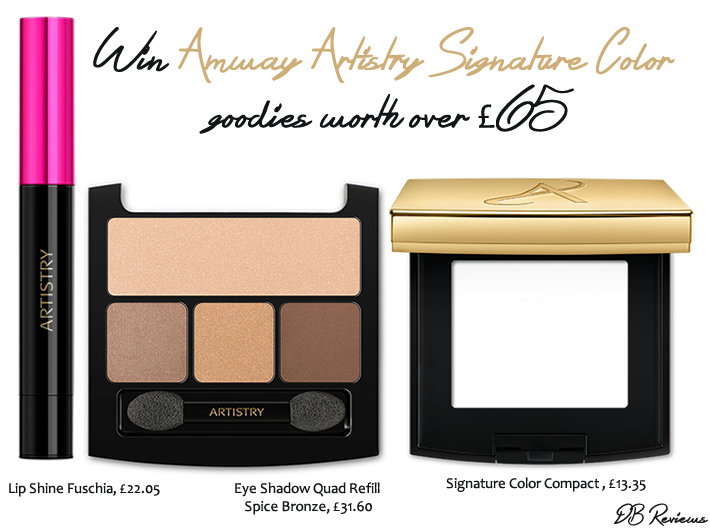 Today, I have a fabulous giveaway for my lovely readers - a selection of Amway Artistry Signature Color goodies worth over £65. Read on to see the products you can win. The Artistry Signature Lip Shine melts on your lips with the rich creaminess of a lipstick and the vibrant shine of a lip gloss. This exclusive, comfortable gel formula is available in two seductive shades, lavishing lips with luxurious moisture and head-turning color that lasts. Artistry Signature Color Eye Shadow Quad Refill allows you to create an unlimited number of eye looks thanks to the multi-dimensional finishes: from a natural daytime look to an elegantly sophisticated effect. Color stays impeccable throughout the day due to the long-lasting formula. There are five palettes, each containing four shades (for highlighting, contouring, accenting and defining), to create your perfect eye make-up. The one pictured in this post is the Spice Bronze palette which includes - pale, golden beige (shimmer) to highlight; warm, antique bronze (metallic) to contour; shiny, amber, copper (metallic) to accent; golden, deep bronze (shimmer) to define. Perfect stay-true color which resists fading and creasing. Multi-dimensional finishes (matte, shimmer, metallic) provided by light reflecting technology. Five palettes, each with four shades to create variety of outstanding looks. Long lasting, creamy formula to blend and mix shades with ease. Shadow resistance for fading and creasing. Safe for use in the eye area. Suitable for use by contact lens wearers. Allergy tested and fragrance free. Artistry Eye and Cheek Compact is suitable for either eye shadow or blush refills from the new collection. Its sophisticated design with a black bottom and gold-toned top is embellished with the stylish ARTISTRY signature “A”. Refills can be changed with ease thanks to a click-in and click-out system. A mirror is also included.